Mega Sale! Save 26% on the Ausein 3D Halloween Pumpkin String Lights, 19.7ft 30 LED Solar Powered Outdoor Waterproof Pumpkin Light for Home Patio Garden Yard Decoration – Warm Whtie by Ausein at Go Plots. Hurry! Limited time offer. Offer valid only while supplies last. New Generation 3D Halloween Pumpkin String Lights --- This 2018 new upgrade cool decoration string lights is composed of 30 pices cool lifelike 3D Jack-O-Lantern pumpkin shape led lights with warm white light, perfect for Halloween theme parties, carnival, festival, celebration and special occasion, get your house into the fun "spirit" of Halloween. Solar Powered, Auto ON/OFF --- The pumpkin light is supplied by solar power, no worry about batteries replacement anymore, it charges automatically at daytime, can light up to 15 hrs with once full charged. Built in a light sensor, it will switch on or off automatically at night and daytime. (Please note that it is at the state of charging at daytime, need to cover the solar panel if you want to light it up at daytime). IP65 Waterproof, Extra Longer String Lights --- The String Lights adapt superior IP65 waterproof technology, both lights and switch controller is made of premium material, ideal for outdoor yard, garden, patio, fence, porch and gate decoration. It is about 19.7inch long in total, the distance of each light is 6.6inch. 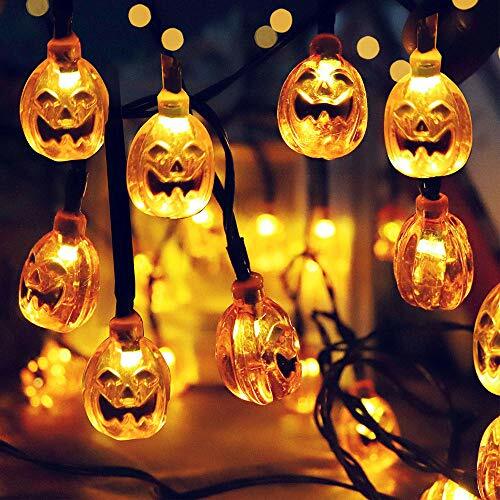 Two Light Modes, Safe and Environment Friendly --- This cute orange Jack-O-Lantern pimpkin string lights freatures two light modes, Steady On and Flash, create spooky Halloween atmosphere for various settings. It is safe to use with low power of 0.2W, also very environment friendly with solar powered.